The sixty-second Soundtrack of the Week is this double CD, Junko Fuji Best Collection Volume Two, one of a series that presents the original soundtrack recordings of music from Toei film productions. Their strategy is to concentrate on films associated with a certain star. 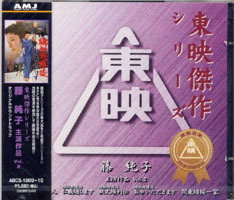 In addition to Junko Fuji, there are CDs of music from the films of Takakura Ken, Tomisaburo Wakayama and Sugawara Bunta, among others. Junko Fuji was the star of the Red Peony Gambler series, in which she played a wandering swordswoman and gambler trying to reconstruct her clan. Those movies are very enjoyable, thanks to Fuji's performance, the moody cinematography and moodier music. The scores to three of those films are here, along with music from two other other Fuji films, Onna toseinin (1971, Chivalrous Woman) and Kanto hizakura ikka (1972, Cherry Blossom Fire Gang). 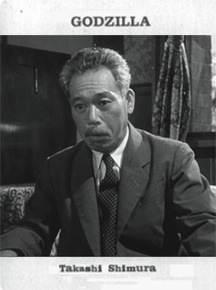 Chuji Kinoshita, Takeo Watanabe and Taichiro Kosugi are the composers responsible for the music here. The general feeling is melancholy with an anxious and apprehensive atmosphere, as the characters are drawn inexorably to their fates by circumstance and code of honor. Usually one instrument dominates, sometimes organ, electric bass guitar, electric guitar, flute or trumpet. This makes the ensemble playing that much more exciting when it happens. 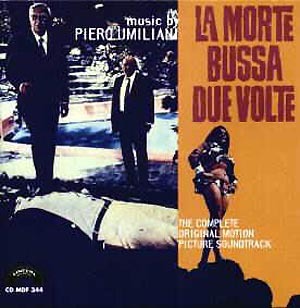 The sixty-first Soundtrack of the Week is La Morte Bussa Due Volte by Piero Umiliani. The first time I heard the first track on this CD, I thought it opened with theremin or some kind of electronic keyboard. It turned out to be a woman's voice, though—not Yma Sumac's, though that's what I was reminded of. That first track is the main theme, a lilting number with a beautiful melody that gets worked out with a number different feels. Sometimes it's bossa, sometimes more latin jazz or rock, sometimes groovy, always great. There are fuzz and nylon string guitars, organ, lots of percussion. I couldn't stop listening to it and played it over and over. I thought about whether I would need it on a desert island. More importantly, it cured me of worrying about whether I bought too many Italian soundtrack CDs. The sixtieth Soundtrack of the Week is "Stand By For Action! ": The Music of Barry Gray. Barry Gray is famous for scoring Gerry and Sylvia Anderson's "Supermarionation" programs like Thunderbirds and Stingray, as well as Anderson's live-action science-fiction series Space: 1999 and UFO. This CD covers the fruitful Anderson/Gray collaboration, starting with two selections from a television program I had never heard of, a Supermarionation western called Four Feather Falls.This is followed by three cues from Supercar, including the very catchy "Supercar Twist". After the Supercar music are four tracks from Fireball XL5. "Formula 5" is a tune in 5/4, indisputably patterned after Paul Desmond's famous "Take Five". (The unidentified alto sax player does a great job of producing a Desmond-like tone.) There's also a vocal version of the theme, called "I Wish I Was a Spaceman" ("I wish I was a spaceman / the fastest guy alive / I'd fly you 'round the universe / in Fireball XL5"). According to the liner notes, this spent 11 weeks on the UK charts in 1963, climbing as high as number 32. Next are five cues from Stingray, including "Stand By For Action! ", for which the CD is named. The theme music for that show is one of my all-time favorites. Following are four tracks from Thunderbirds, then six from Captain Scarlet and the Mysterons, whose theme music is even better than Stingray's! 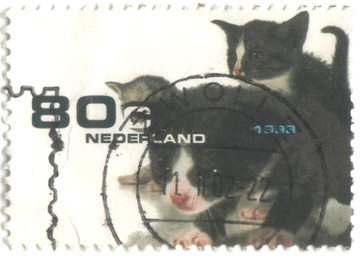 The opening features screaming cats, machine gun fire and mysterious footsteps. "White as Snow" is extremely catchy and "The Mysteron Theme" is a lovely and ethereal piece that I've always wanted to cover. After Captain Scarlet come five pieces from Joe 90. Of this material, my favorite is the backbeat-driven "Hijacked", originally released as the B side to single of the main title. It sounds like John Bonham in Motown or something. Next are two tracks from The Secret Service, with its very unusual main title music, an a capella jazz fugue. There are five selections here, beginning with the terrific opening credits music, an uptempo, organ-driven, instrumental rock masterpiece. "The Trip" is also a great cue, from a hippies-on-acid episode called "The Long Sleep". The CD conludes with four pieces from Space: 1999, a show I remember loving when I was a kid. I had the toy spaceship and the Martin Landau and Barbara Bain action figures. Watching it again recently I was impressed by how cerebral and poignant many episodes of the first season were. 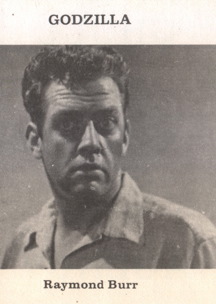 With the second season everything kind of went to hell as the show was produced on a lower budget and became more of a Monster of the Week show. Of course, those were the episodes I liked best when I was a kid. I wanted monsters, not thoughts. The main title music manages somehow to outdo the UFO theme, by starting with strings and then assaulting the listener with wah-wah pedals and distorted guitars. As promised, the CD includes previously unreleased tracks. 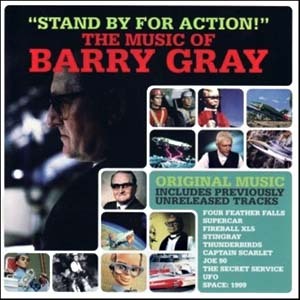 Even though I already had about ten Barry Gray CDs, many of them devoted to music from the shows represented here, several tracks on "Stand By For Action!" I heard for the first time. While this 80-minute compilation is the best place to start for anybody new to Gray's work, it's bound to please those who are already fans. 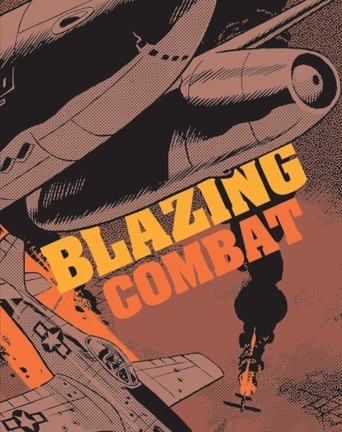 New from Fantagraphics is Blazing Combat, a reprint of all four issues of the anti-war comic book of the same name, originally published as a quarterly, in magazine format, from October 1965 to July 1966. The covers of the four issues were painted by Frank Frazetta and were stunning. My only criticism of this collection is that it does not present complete facsimile editions of the original magazines. It would be great to see full-size reproductions of these covers as well as the letters pages—Milton Caniff wrote a letter praising Blazing Combat, which was printed in the second issue, with "Milton" misspelled as "Mitlon"—and other ephemera that surrounded the stories. Why only four issues? Well, apparently, people in the military and the American Legion realized that the theme of the book was "war is hell" and saw this as a threat to support of the war in Vietnam. The military forbade its sale on military bases while the American Legion put pressure on the wholesalers to kill the title. 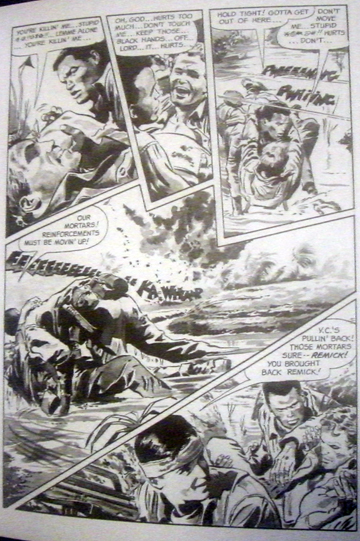 It was a consignment business in those days, so the wholesalers destroyed all the copies of Blazing Combat and truthfully reported that they were "unsold". Blazing Combat was published by James Warren's Warren Publishing company, also responsible for Famous Monsters of Filmland, Creepy, Eerie and Vampirella. 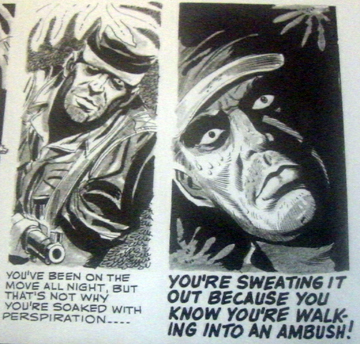 The first story in the first issue of Blazing Combat is called "Viet-Cong!" and takes place in Vietnam. Everything you can expect from future stories is here: the beauty of life, the ugliness and pointlessness of war. "What's it all mean?!" wonders an American "advisor" in Vietnam. The juxtaposition of the butterfly and the helicopters speaks for itself. These panels and the others I've uploaded look much better in real life than they do here. I can't scan the pages very well without destroying the book so took lazy snapshots of them instead. The second story, "Aftermath! ", takes place during the American Civil War and is something of a masterpiece of horror. A Confederate soldier opens fire on two Union soldiers and wounds one of them. As the unharmed Union soldier takes cover, his mortally injured partner screams in agony. The two enemies call a truce to minister to the poor soul, but by the time they've overcome their fears of each other, it's too late. The soldier is dead. Together they bury him so his body won't be eaten by the starving wild hogs that roam the countryside. By the time they're done, they've become friends—but then they begin to argue about who started this war anyway and end up fighting. They kill each other and the wild hogs devour their corpses. 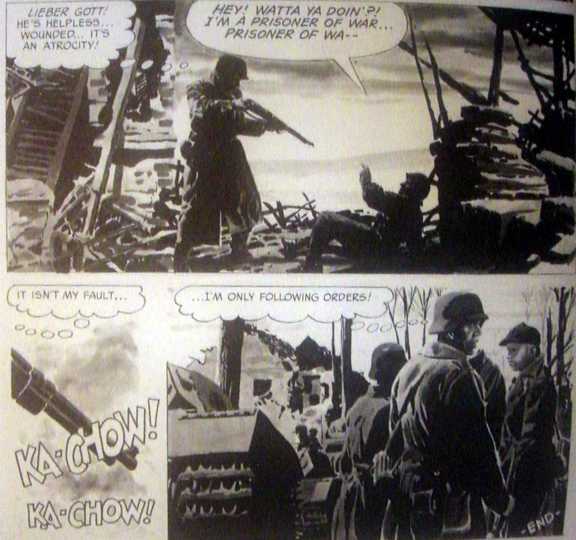 Of the remaining five stories in the first issue, three take place during World War II, one in World War I and one in the American Revolutionary War. 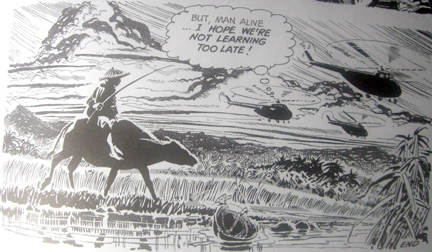 The last panel of "Long View!" shows a Marine in tears as he considers how indifferently his fellow soldiers are sacrificed for military objectives. "The whole plan worked, Captain Wayne... Can't you see... Can't you cheer... Can't you take the long view?" The second issue has another American Revolution story, an extremely ironic one that ends with the American soldiers wishing there more officers like Benedict Arnold. There are also a Spanish American War story, another Vietnam story, two Korean War stories, one WWI story and one WW2 story. Two of the storytelling techniques struck me as being particularly effective. The first is the telling of the story in the second person. 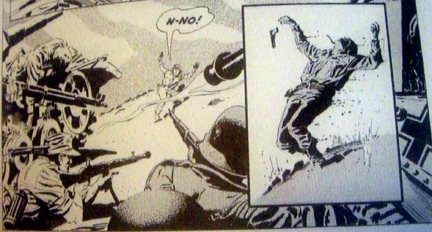 The other technique involves layout, going from conventional, square and rectangular panels, evenly placed, to jagged, broken, off-kilter panels, thus shattering the formerly sedate page itself in a way that mirrors the chaos of armed conflict. It seems that the second issue's first story, "Landscape! ", about a Vietnamese farmer whose loses everything in this war that he neither understands nor participates in, is what led to the destruction of Blazing Combat. 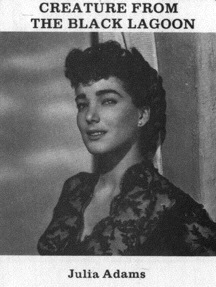 Warren Publishing managed to put out only two more, both at a considerable loss. The third issue covered new ground with a post-World War III story, in which a survivor of nuclear armageddon has to contend with the unexpected appearance of other survivors, and a story from the American Indian Wars. Vietnam and the American Civil War are re-visited in one story each, and the remaining three stories take place in World War II. One of these, "Souvenirs! ", is especially harsh. Soldiers come across the corpse of a Marine and assume that he died bravely revealing a Japanese ambush. In fact, the man had been sneaking under cover of night to steal gold fillings from the teeth of dead Japanese soldiers and and stumbled into the ambush by accident. The fourth and final issue has four World War II stories, two World War I stories, one Vietnam story and one Korea story. One of the World War II stories also contains the story of the Spartans at Thermopylae. The last story of the last issue ends with the twentieth century's most infamous and terrifying rationalization. 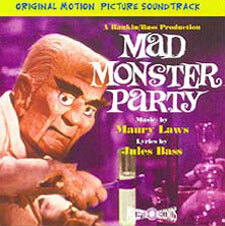 In honor of the Creature Features game, the fifty-ninth Soundtrack of the Week is Mad Monster Party, with music by Maury Laws and lyrics by Jules Bass. This album was supposed to hit stores in 1967, when the movie came out, but lack of money prevented its release. Thirty years later, though, the people at Retrograde Records, Percepto Records and Film Score Monthly made it happen! It's a must-have for fans of Henry Mancini and John Barry, two likely influences on the music. The title song, sung by Ethel Ennis, is by far my favorite track but there's a lot of great music here. "The Baron" and "Jungle Madness" are also exceptionally good. How can you resist any record with vocal numbers by Boris Karloff and Phyllis Diller? 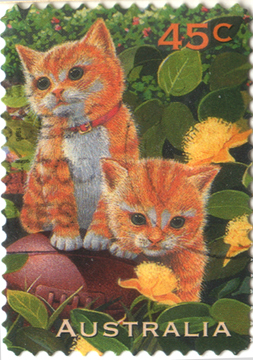 My friend Joe gave me three more cat stamps yesterday. Here they are. Here's a recent project of mine. My brother thought I should document it here. 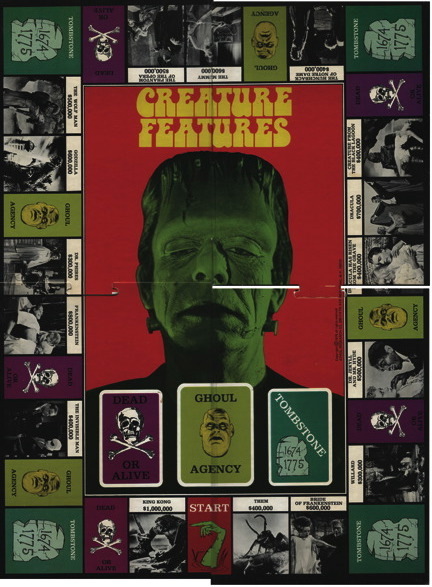 When he and I were kids we played this board game, Creature Features: The Game of Horror. 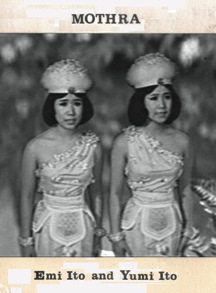 At that time we were devoted to Creature Double Feature on TV every Saturday and were thrilled to find many of the movies represented in the game. The way the game works is like Monopoly but you're a movie producer instead of a real estate speculator. You roll the dice and move your piece the corresponding number of squares. If you land on a movie and nobody else owns it, you can buy it from the bank. If another player owns it, you have to pay them a certain amount of money. 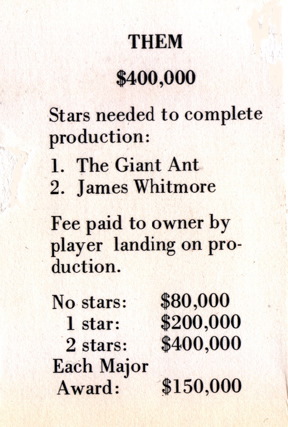 Here's the production card for Them, which makes this clear. 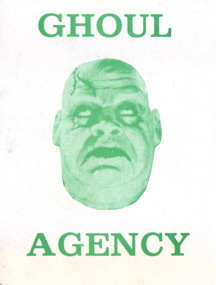 Here are "Ghoul Agency" cards. Each movie has two, one for each star. While my brother and I have fond memories of playing this game, we hadn't seen it in decades. 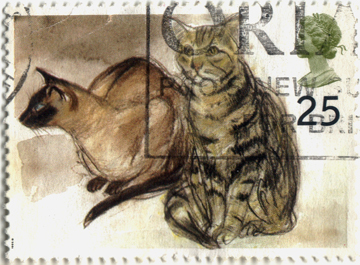 A few years ago, though, my mother got one on eBay and gave it to me as a birthday present. We all played it on my actual birthday, after Dexter went to sleep, and my first role landed me on Godzilla. That was a great birthday! Recently I played it with very good friends from Sweden who visited us. After they left, I decided to copy the game for them so they could play it at home. It's very hard to find and I suspect that the original movies were not licensed in the first place, so I felt okay about making a bootleg version of it. I scanned the board as best as I could, then scanned all of the cards. Since our Swedish friends are big fans of Godzilla and other Japanese monsters, I thought it would be fun to modify the game a bit, add Gamera and Mothra, for instance. Of course I had to remove something for anything I wanted to add. 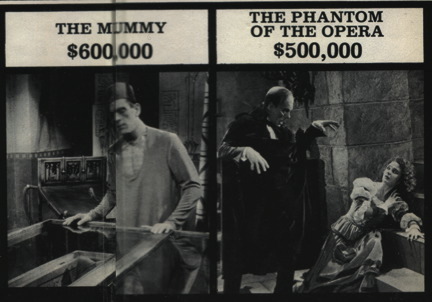 The Creature Features game boasts of having the "greatest movie monsters in film history". 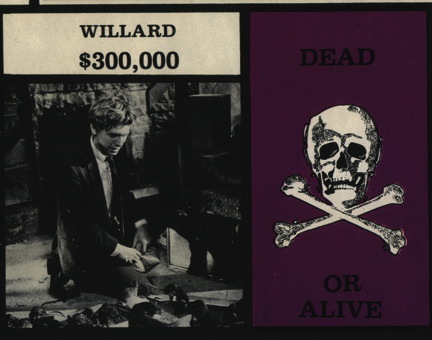 Now does anybody, anywhere, consider the rats from Willard to be among the greatest movie monsters in film history? That one could go, I decided. 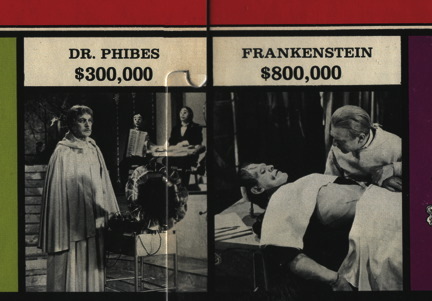 While The Abominable Dr. Phibes is a good movie, and it's nice to have Vincent Price in the game, Phibes also doesn't seem like one of the greatest monsters ever. And the movie is similar to The Phantom of the Opera, on the board already. The same thinking led me to cut Dracula Has Risen from the Grave. It would have been nice to see a Hammer film here, as well as Peter Cushing and Christopher Lee, but the game already has Lugosi's Dracula and one Dracula should be enough. 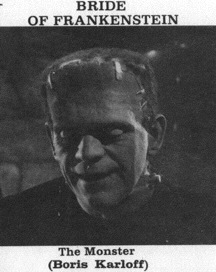 For the same reason I considered removing The Bride of Frankenstein, seeing as Frankenstein was already there, but Elsa Lanchester's Bride is the only female monster on the board. (Mothra would become the second.) It remained. Reptilicus snuck in because I remember seeing it on Creature Double Feature. 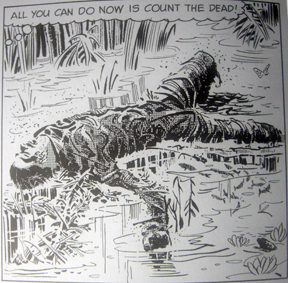 I would also have liked to add The Brain That Wouldn't Die which I vividly remember seeing on Creature Double Feature. It gave me nightmares for a long time. 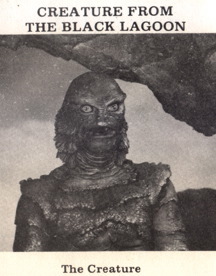 The Beast from 20,000 Fathoms would also have been a good addition, both to honor Ray Harryhausen and also because our Swedish friends enjoyed the Cyclone while they were here. 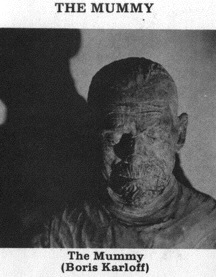 The Mummy didn't survive the scanning process very well. I repaired it but then decided to replace it. 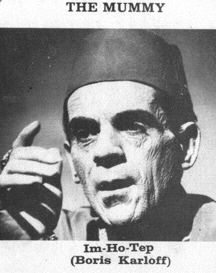 I love The Mummy—it's a classic—but both of the Ghoul Agency stars are Boris Karloff. 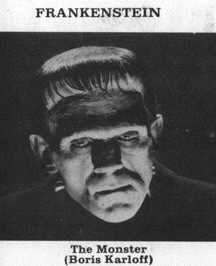 Karloff is also a star of Frankenstein and The Bride of Frankenstein, so that means that out of 32 stars (and 32 Ghoul Agency cards) in the game, four are Boris Karloff. He's great but that didn't seem fair. 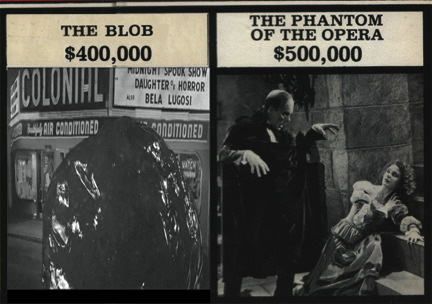 The Blob is certainly one of the greatest movie monsters in film history and here it is outside of a "Midnight Spook Show" featuring Daughter of Horror (a.k.a. Dementia). "And Bela Lugosi" is a nice touch. It doesn't matter what movie it is—Lugosi's in it! Truly this is in the Creature Features spirit. 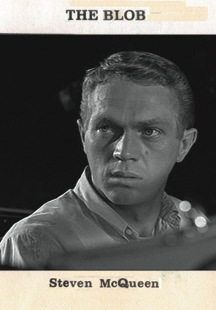 It also let me make a Ghoul Agency card for Steve McQueen, billed as "Steven McQueen" in The Blob. I was very pleased that adding Mothra let me make a Ghoul Agency card for The Peanuts. As long as I was messing around like this, I decided to make Godzilla more expensive. 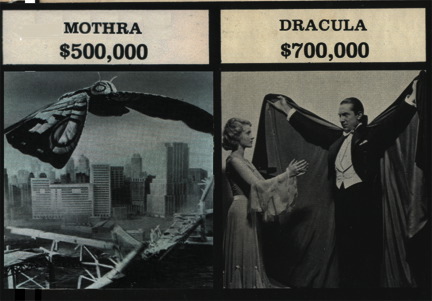 At $1,000,000, King Kong is the most expensive property on the board. 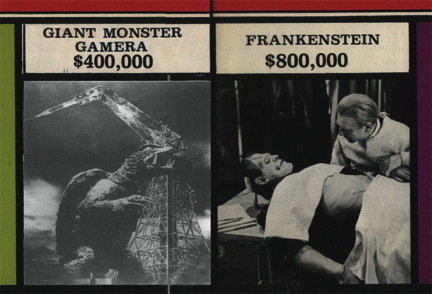 Godzilla is a bargain at $600,000, the same price as The Mummy and Bride of Frankenstein. 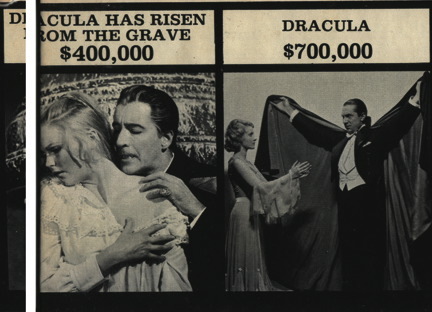 Dracula is $700,000 and Frankenstein $800,000. 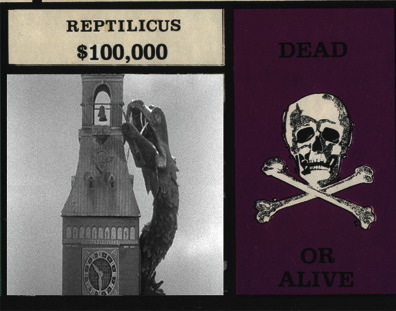 I raised Godzilla's price tag to $900,000. Much better. Want to play?